On October 29, 2015, an AMBER alert was issued for a missing 2-year-old girl, Brooklynne Enix, from Knoxville, Tennessee. Authorities sent out the alert when they found the little girl’s mother dead in her home. She was last seen with her father, Tyler Enix. Authorities suspected Tyler was responsible for the murder, and they believed that the father had taken the 2-year-old with him. While this AMBER Alert was sent out in Tennessee, two states over, a man named Steve Adams realized the shocking truth. He looked up while driving and noticed a black car from Tennessee that fit the description of the car given in the alert. “911. 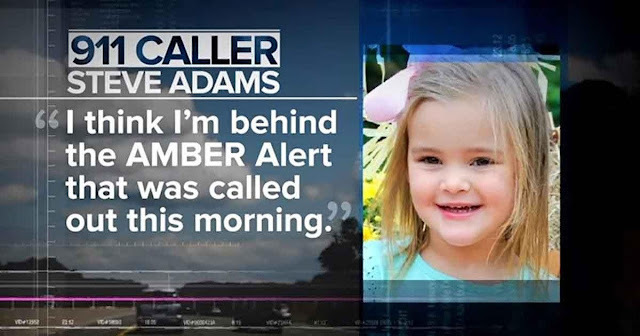 My name is Steve Adams and I think I’m behind the Amber Alert that was called out this morning about a child from Tennessee,” Adams said in a 911 call. Rather than shy away from this situation, Adams stood strong. “I tried to stay back. I used hands free on the phone, so he didn’t see me on the phone and kept relaying where he was,” said Adams to WKRN. Thanks to Adams’ surveillance, the authorities were able to stop the car and save Brooklynne’s life.